The Enterprise is caught in an anomaly where an omnipotent being studies their reactions to a series of seemingly inexplicable events. Worf tried to get Picard to be more careful, but Picard didn't listen. They get caught in the anomaly, and I bet Worf is thinking, "Told you so." Why does Dr. Pulaski show up on the bridge? Is she bored? I like how this episode starts out, with a sense of bemusement quickly falling into a panicked realization that all control over reality has been lost. It is, in essence, a very bad trip. Picard's testimony about his own beliefs concerning life and death is a striking little monologue. Riker agreeing "wholeheartedly" to end the auto-distruct is pretty funny. 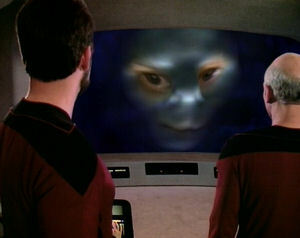 Riker to Wesley: "Ensign, if you encounter any holes, steer clear." Yeah, I'm not gonna comment on that one. I like the idea of this episode, but the climax and conclusion could have been a little more fleshed out. Picard's decision to blow the ship isn't adequately explained or discussed, and Nagilum isn't properly developed as anything more than just a weird omnipotent being. This is the first episode to show the relationship between Riker and Worf, which will eventually go to lots of interesting places by the end of the show's run. You can start to see that Riker understands Worf more than any of the other crewmembers and that Worf has a certain respect for Riker. It's easy to be annoyed with how Dr. Pulaski treats Data, but her confusion as to whether or not Data is alive and sentient is no small matter. It's good they address and explore these philosophical problems in "The Measure of a Man" a few episodes later. It's possible that the writers are even using Dr. Pulaski's attitude in this episode to foreshadow it.